Really good cross-referencing: O’Connor is very good about noting where similar rules are discussed, and similar ideas mentioned and pointing you to them. Good examples: The examples are not only easy to understand, they are relevant, and it is not difficult to figure out how they translate to other situations. Clear rules: O’Connor lays out in plain terms what the rules are, why they are, and when you can ignore them. All of this written in plain English, in case you don’t know a subject from a predicate. Funny: The funny in Woe is I tends towards the corny, but it is funny all the same. For example, on page 130 in the discussion of spell-checkers and using them only as a backup, “oar Yule bee sari.” This and similar jokes keep Woe is I entertaining, a must if you’re going to read over 250 pages about grammar. 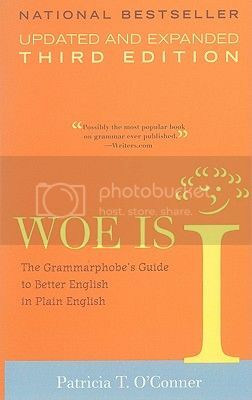 Both engaging and informative, Woe is I is a great basic grammar guide. November 8th, 2012 | Tags: borrowed copy, grammar, Publisher: Penguin | Category: Misc.